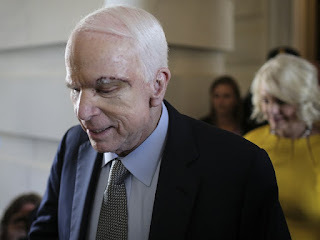 I had the opportunity to see some of Senator John McCain's speech to the Senate on Tuesday. There may be no one who better understands the construct of the American government, our Republic, than John McCain. He mentioned that the Senate had done nothing all year more than once. He also has a great grasp on the concept of checks and balances--he was clear and unequivocal in his assessment of the unwelcome influence of the President on the Senate. The Senate needs to exert leadership in the Congress for America. I was impressed with Senator McCain's grasp on the true importance of the Senate and its check on the powers of the unruly presidency. I urge you to read the test of Senator McCain's speech and relive the greatness of what America was and yet should be.